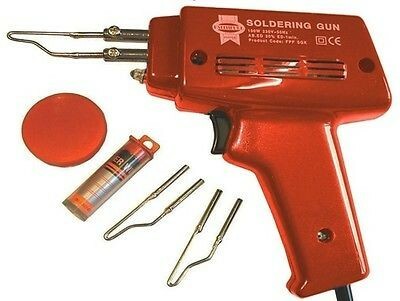 Brand New Faithful Instant Heat Soldering Kit The Faithfull kit of soldering irons are lightweight with heat resistant handles and come in 240 Volt (100 Watt) versions. This Faithfull SGK is suitable for soft soldering metal alloys, brass and copper. The working temperature is reached quickly so you get a good soldered joint on any work piece. The SGK gun features a safety working / indicator light so you can see your work piece and you also know the iron is on. This Kit comes complete with 2 x soldering tips and flux. The SGK is a 100 watt iron ideal for fine soldering and hobby work on circuit boards, jewellery and models or for repair work on electrical items. It comes with a fitted 13amp plug. Includes: 2 Soldering tips. 1 Solder wire. 1 Resin flux. Instant heat up to 400° C (750° F). 100 Watt. Fitted BS approved 13amp plug and cable.